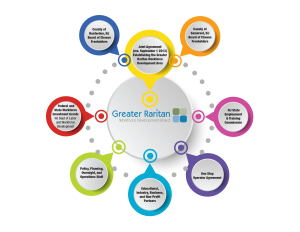 In order to establish a governance structure for the Greater Raritan Local Area, certified by the New Jersey State Employment and Training Commission, both Boards of Chosen Freeholders of Hunterdon and Somerset Counties and the Greater Raritan Workforce Development Board entered into a “Joint Agreement” to further define roles and responsibilities of the partners. The following chart shows the relationship between the Boards of Chosen Freeholders, the Greater Raritan Workforce Development Board, State entities, the Board’s staff, and the One Stop Career Center Training Services Operator. Please visit New Jersey’s State Employment and Training Commission’s website to learn more about the various local Workforce Development Boards throughout the state.